The best time to make pickle is in the summer, when your garden is overflowing with things that need to be eaten or preserved. 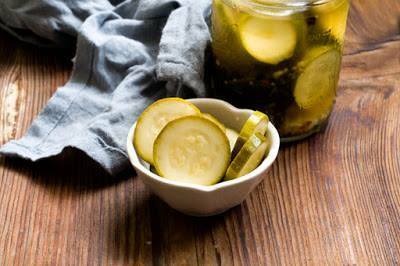 Typically, when people think of pickles the first thing that comes to mind is a pickled cucumber, which is the most ubiquitous type of pickle. Of course, it has a reason for being so prominent in that a cucumber makes for a fine pickle with its tough skin and firm center. It absorbs the brine beautifully, managing to be crisp and juicy at the same time. If you’re a fan of cucumber pickles and you find yourself with an abundance of zucchini, allow me to present to you these spicy dill zucchini pickles, a fine way to use up some of the squash that is everywhere this time of year. Read more & find recipe here: http://www.homesicktexan.com/2014/07/spicy-dill-zucchini-pickles.html?